Help us do our bit to stop the spread of invasive aquatic plants and animals like killer shrimp, floating pennywort, zebra mussel and water primrose. CHECK: Check your equipment and clothing for living organisms. Pay particular attention to areas that are damp or hard to inspect. CLEAN: Clean and wash all equipment, footwear and clothes thoroughly. If you do come across any organisms, leave them at the water body where you found them. 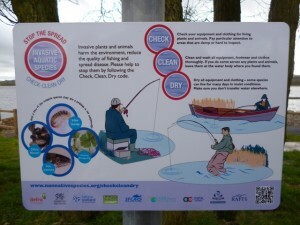 DRY: Check your equipment and clothing for living organisms. Pay particular attention to areas that are damp or hard to inspect.